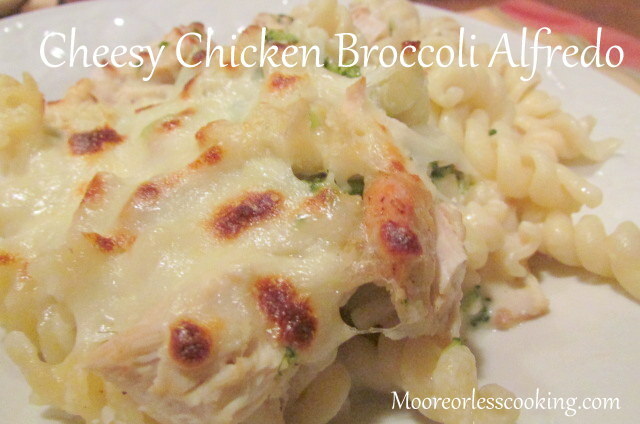 We have been lo- carbing at the Moore’s so I have invented a new recipe for you! If you have all of your ingredients ready, it is a cinch to put together. I used soy flour to make the bechamel sauce, it doesn’t get as thick as a regular flour Bechamel for mac and cheese, but don’t worry, the Rotini Pasta thickens it up. I used shredded Cabot Sharp Cheddar and Mozzarella and Romano for the cheeses. My daughter requested Chicken Alfredo for this weeks menu, so I thought I would add Broccoli so that it was a one dish meal, the kids had no idea it was lo carb, so it was a win -win!! In a large pot of boiling salted water, cook pasta according to package instructions. Within the last 2 minutes of cooking time, add broccoli; drain well. Heat olive oil in a large skillet over medium high heat. Season chicken breasts with salt and pepper, to taste. Add to skillet and cook, flipping once, until cooked through, about 3-4 minutes per side. Let cool before dicing into bite-size pieces. Melt butter in the skillet over medium heat. Whisk in flour until lightly browned, about 1 minute. Gradually whisk in chicken broth and milk, and cook, whisking constantly, until incorporated, about 1-2 minutes. Stir in heavy cream and garlic powder until slightly thickened, about 1-2 minutes. Stir in Parmesan until well combined, about 1 minute. If the mixture is too thick, add more milk as needed. 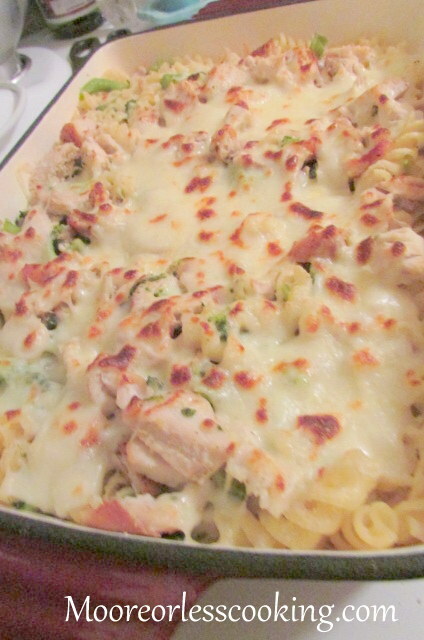 Stir in pasta, broccoli and chicken. Gently toss to combine; season with salt and pepper, to taste. Sprinkle shredded cheeses over pasta mixture, place in preheated oven at 350 F, bake until cheeses are melted and golden brown. This definitely sounds like a winner! Definitely pinning for later…thanks Nettie! Cheese, cheese and more cheese, this looks so good!! Oh this looks so good! Perfect comfort food. I’ve yummed the recipe for later. Thanks! Looks gooey, cheesy, and completely delicious! Nettie! Your Alfredo looks amazing!